I ended up trimming everywhere, including the inside and outside of the legs. When I got to the upper portion of the mantel it got a little tricky. The width I had made the crosspiece wasn’t very wide and appeared squatty, especially when I was starting to trim it. I knew I needed to add height. I couldn’t add a ton without rebuilding the entire thing so I decided to add the top trim so it lined up with the top of the mantel. I used 1×4’s here because the top inch of these pieces will be covered by crown moulding. I had to rip out the 1x3s I used previously (but I reused those on the hearth trim) and make 1x3s that were taller. This was a good decision because it balanced out the mantel so much more. Once those were in place I used scrap wood behind it to give it more stability. 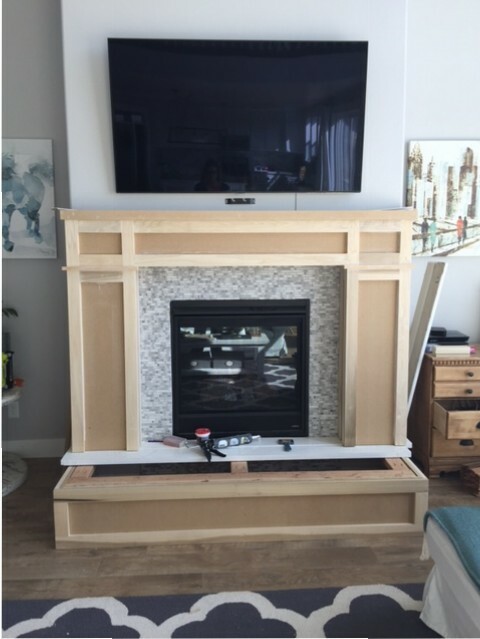 Then I wrapped the entire mantel top with a 1×2 piece of scrap MDF I had in order to give the mantel just a bit more height. I wanted the top cross piece to be the same height as the legs are wide. Wow! That looks so great! Thanks very much for sharing as this is exactly what I’ll be doing next month! Timing! 🙂 I love the crown moulding! I cut scotia (cove) for the first time recently, and it nearly did my head in trying to match the cuts up correctly. Eventually discovered I had to place everything on the saw backwards and upside down! (I’ve kept samples with instructions written on them for next time! Nearly drove me nuts!). Thanks again, Heidi. Well done! Thanks! Good luck with yours!